Richard comes from a musical family, and inspired by his uncle Brian, purchased his first guitar when about 8 years old. He started his musical career playing in school concerts, and formed his first band in the late 60’s with work friends. (That’s the 19-60’s!) He recalls doing local clubs and “anyone that would have us”, and maintains, amazingly, they never got boo’d off! Hmmmm……. In the early 70’s he joined K.B. 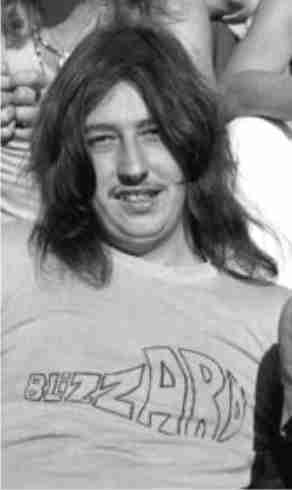 and Paul Dyson (ex New Foundations bass maestro), to form the band “Blizzard”. They were subsequently joined by Spencer James and spent a few great years playing local clubs, recording, and touring Majorca. Richard purchased a small business after starting a family, so had to reluctantly leave Blizzard and concentrate on trying to control the company and the kids. During the 1990’s he formed a band with work colleagues called “Rich T and the Biscuits” (yes, you did read that right!) On stage, Richard, resplendent in a white suit reminded people of “Boss Hog”! “Fun people, and good musicians”. More recently, Richard lost touch with old musician friends. Probably because he would clear all their larders and fridges of food, so they would pretend to be out when he called round! Later the same year, Richard was invited to join The New Foundations playing bass, and subsequently lead guitar, “with some super musicians and old friends”. He now spends much of his time clearing all OUR larders and fridges of food! Richard uses a Gibson Les Paul Standard, Eko 12 string acoustic, and a fender Jazz bass, powered by Fender Super Sonic and H//H guitar combos.